Hi and welcome to another Heartfelt Creations Inspiration Wednesday! This is the last week featuring the Classic Petunia Collection as next week we're debuting a gorgeous new collection. 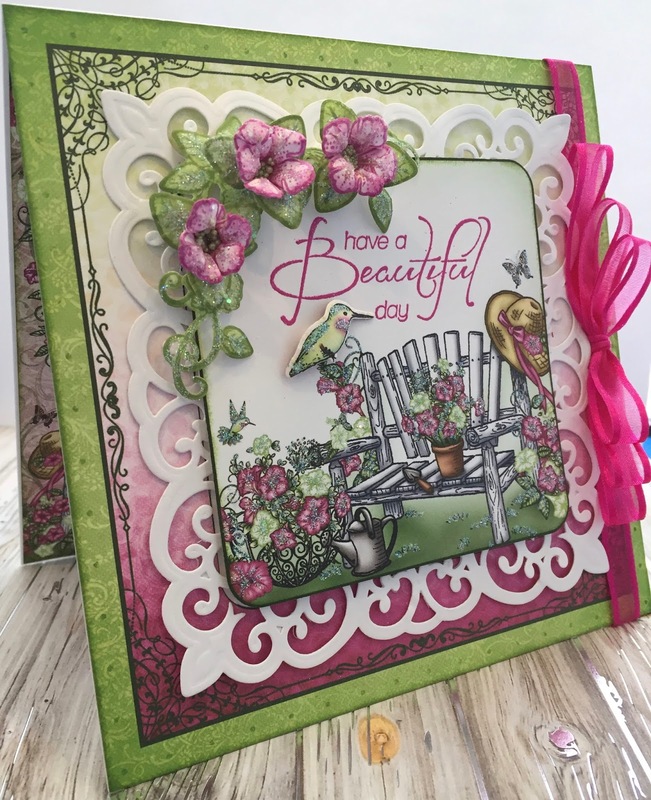 Today I'm sharing a card made with one of the absolutely beautiful card fronts from the paper pad. Other Products: Pearl White Metallic Cardstock, VersaMark, Ranger Magenta Embossing Powder, Misti, Big Shot, Dimensional Foam Tape, Spellbinders Victorian Medallion 3 Die, ribbon from my stash, Bow-It-All 2, Hot Glue Gun. Instructions: Create a 6 x 6 card base using the Pearl White Metallic Cardstock. Cut the card front from the paper collection, ink the edges with Bamboo Leaves. Using the Cut Mat Create 2B Die, cut out the center panel, ink the edges, stamp the sentiment using VersaMark and heat emboss using Magenta embossing powder. Make a bow and adhere it to the card front, then adhere the card front to the card base. Cut the Victorian Medallion and adhere it to the center of the card front with dimensional tape. Add the center panel with dimensional tape. Stamp the Classic Petunia flowers with Lilac Posies ink and die cut using the Classic Petunia die. Color the flowers with Lilac Posies inks. Shape the flowers and the leaves with the Deluxe Flower Shaping Kit, add Prills to the centers and glitter with Rajni Chawla’s Crystal Clear. Cut a hummingbird from the Botanic Orchid Collection paper pad using the Regal Hummingbird Die. 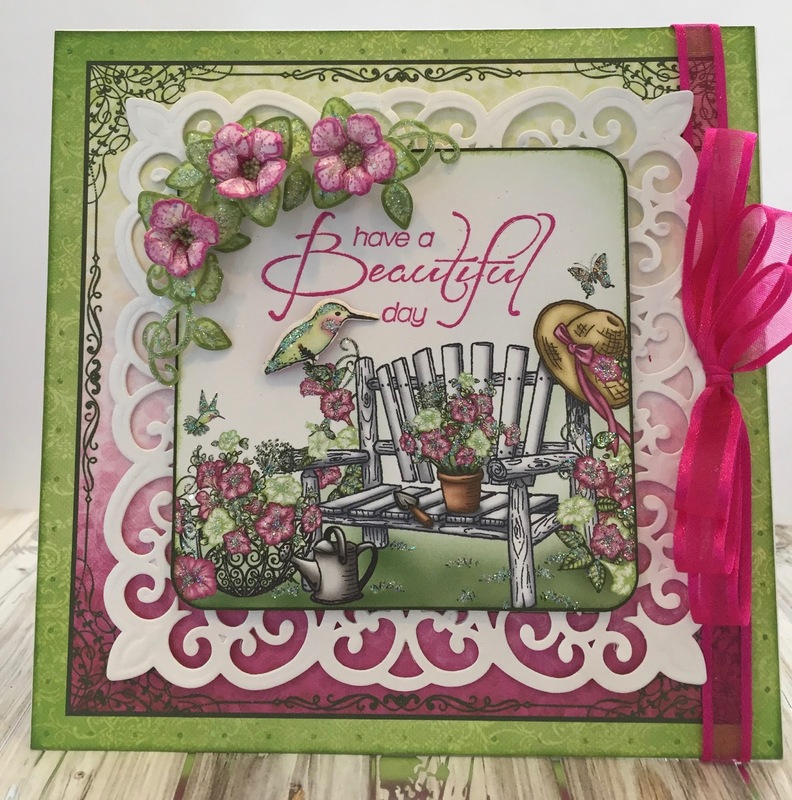 Add the flowers, leaves and Hummingbird to the card front using hot glue gun. 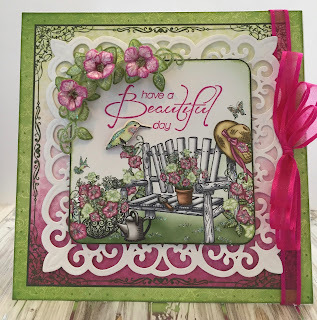 Cut There's Beauty in my Soul Today panel from the paper collection, ink the edges and add to the inside of the card. Glitter everything with Crystal Ultrafine Transparent Glitter. Thank you so much for stopping by and please be sure to visit the Heartfelt Creations Blog https://www.heartfeltcreations.us to get inspired by the gorgeous projects created by the fabulous design team. Well, that's all for now. Thank you so much for stopping by and have an absolutely beautiful day! Beautiful! I so love these flowers and love that beautiful garden bench! I wish I was sitting in your card!